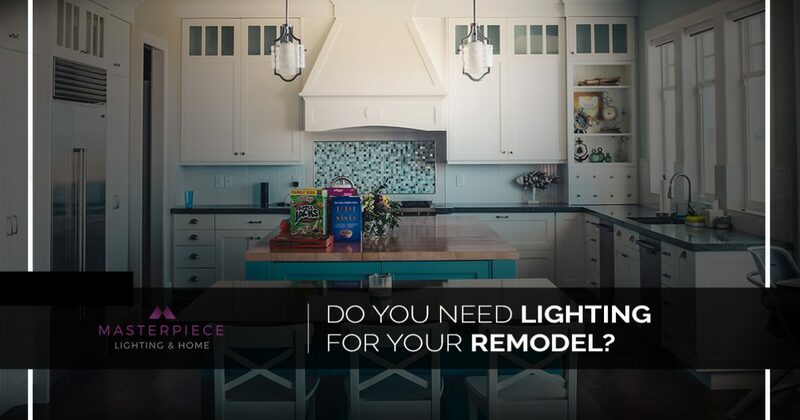 Do You Need Lighting for Your Remodel? You may have spent all summer looking for a new home, and if you’re someone who likes a challenge, then you may have opted for something of a fixer upper. Your mission this fall is to remodel as much of the house as you can, and at Masterpiece Lighting in Atlanta, we’re here to help you create the perfect lighting design for your new home. When it comes time to choose new fixtures, we’ll be ready to help you choose the best options! When it comes to lighting your new residence, there may be nothing that’s completely off the table. If you’re creating completely new, open floor plan, then you may want to go with transitional lighting that walks the line between traditional and contemporary. With so much open space, you’ll want to be sure that every area is properly illuminated. This can include integrating everything from modern chandeliers to recessed lighting to wall sconces. As you’re remodeling, think about where your seating or dining areas will be, as well as which walls will stay and which ones will be removed. Perhaps you have some rental properties around the city that are in need of an update, and you plan is to tackle those projects this fall. Each house or apartment will have its own look and feel, and it’s important to find fixtures that fit the property’s personality. You can always change how a residence looks and functions by adding new lights, and taking out old fixtures and replacing them with updated options can completely transform a rental property. Your current and future tenants will surely love the new lighting, and you’ll also be providing them with more energy-efficient fixtures. If you’ve already started on your remodeling project, then now is the perfect time to be thinking about your new lighting design. If you’re still a few weeks away from getting started, then feel free to bring in any design ideas that you have, and we’ll show you fixtures that could fit your vision for your home or rental property. Be sure to speak with your contractor or electrician, if you’ve hired one, about your lighting plans so that you’re sure everyone is on the same page. Installing your new lights yourself is an option, but it’s important to make absolutely sure that you know what you’re doing before you attempt to hang a chandelier in the entryway. At Masterpiece, we’re here to help you navigate your home remodel successfully by providing outstanding lighting options at prices that fit your budget. It doesn’t matter if you’re tackling one room at a time or the entire house – we can help you choose the right fixtures. Visit one of our showrooms in Atlanta or Roswell today to speak with a member of our expert team. You can also call us or contact us by using the button below. We’ll gladly answer any questions you have regarding your new lighting.